All serious mineral enthusiasts have a library of mineral books. Some of these volumes are well-worn due to regular use, like nearly all copies of Frederick Pough’s "A Field Guide to Rocks & Minerals." Others are large-format, coffee table books overflowing with glossy pictures. 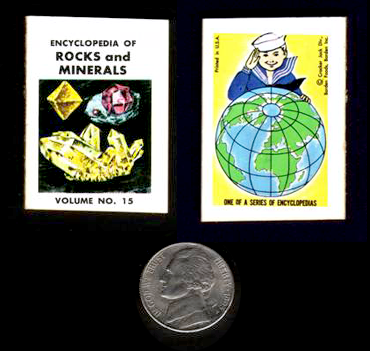 On one of my regular safari’s through eBay I discovered what can be categorized as the tiniest mineral book ever published, "Encyclopedia of Rocks and Minerals," published by Cracker Jack Division of Borden Foods, Borden, Inc. This little “Encyclopedia” (a very generous word for a very small publication) is No. 15 in a series of 20 little “encyclopedias” published as prizes for Cracker Jack boxes in the late 1960’s. Borden Foods owned and operated Cracker Jack at the time of its publication. This literary thumbnail specimen measures 1 ¼ inches wide by 1 ¾ inches tall. Though small in size, the Borden Company was able to pack 32 pages of text and pictures into the book (that is, 16 pages printed front and back), not counting the heavier cover. The pages and covers are perfect bound with glue on the binding edge. The covers are printed in color while the content pages are printed in black and white. The images and text are from early editions of Rocks and Minerals: A Guide to Minerals, Gems and Rocks by Herbert S. Zim and and Paul R. Schaffer with illustrations by Raymond Perlman. This was one of a series of nature books published under the title of A Golden Guide. Apparently Borden Foods licensed the republication of the Golden Guide book for the Cracker Jack edition. In the Wikipedia entry for Cracker Jack, an author writes, “Cracker Jack is best known for its inclusion of small, useless, but amusing prizes.” This tiny mineral book is small and amusing. 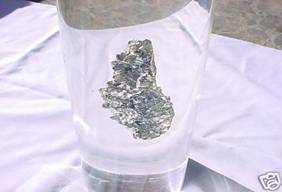 But to mineral collectors like me, it is interesting, intriguing and far from useless. This is a story about fortuitous timing and eBay. A recent and pleasurable addition to my mineral collecting is a search for mineral books autographed by their authors. 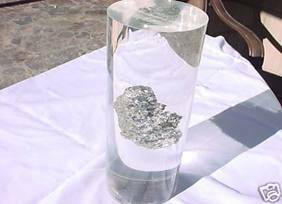 On a regular basis I visit eBay and type into the search box “mineral signed.” One evening, in the summer of 2008, the results included an autographed book by mineralogist George Letchworth English. In addition, the seller added “as an extra” an antique cabinet photo card of a “Rev. Geo. 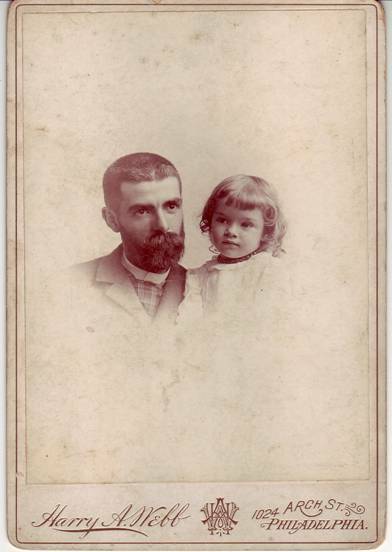 English and his little girl.” The opening bid was $6.99. The “Buy it Now” option was $9.99. I bought it immediately. It was my hunch that the inscription on the back of the photo was simply misread. George English’s father was a minister, but I was not certain that the seller really had any idea of the history of George English or his family. When the book arrived, it proved to be much more of a treasure than I had expected. This autographed edition of the book, in which he inscribed “Dedicated to the pleasurable study of minerals - George Letchworth English,” turns out to be a special printing produced in Rochester, New York in 1934 by the Mineralogical Publishing Company (perhaps a private printing on his part?) In that same year, McGraw-Hill Company published the same book. Both books were published under the title, “Getting Acquainted with Minerals.” At the time of its publication, Mr. English was a consulting mineralogist working for Wards Natural Science Establishment in Rochester, New York. The cabinet photo is a treasure in itself as well. Upon close inspection, one can readily see that the inscription on the back of the card is “Geo. L. English, & ‘little Gwendolen’ aged 2 yrs. 4 mos. taken July ‘93. For ‘Florence.’” the handwriting matches the signature in the book. In other words, George English inscribed the back of the photo. The cabinet photo was taken by, or at least at the studio of, Harry A. Webb, 1024 Arch Street, Philadelphia. Gwendolen was George English’s eldest child (the next two were Henry Rowland and Katherine Louise). In 1958, David Jensen - who was the consulting mineralogist at Ward’s at the time - updated and published a revised edition of English’s book. It is interesting to note that the copyright of the revised edition was held by Mr. Jensen and Gwendolen English Burleson. There are two portrait-style pictures of George English that have been published repeatedly. They are both of an older English. This portrait, seen above, is the earliest picture of Mr. George Letchworth English, a significant contributor to the field of mineralogy in the late 19th and early 20th centuries. This fine old book was only a few days from being dumped in the trash. The seller who posted it on eBay picked it up at a church yard sale in Maine. He said the picture grabbed his attention but the book itself didn’t seem to be all that interesting or important. His goal was to buy a book for a dollar and sell it for ten which is a pretty good return on investment. We’ll never know how many similar treasures are now rotting in a landfill. Arthur Court is a well-known mineral collector from California. In 1975 a striking coffee-table style book was published by Harry N. Abrams, Inc. called Minerals: Natures Fabulous Jewels. This beautiful book featured outstanding specimens from Arthur Court’s personal mineral collection. In February 2009 the “floating column” pictured here came available on eBay. It sold for less than $10. The third picture shows that the column was signed and dated by Arthur Court himself in 1970. Arthur’s wife, Elena, sent the following information about this piece by email. "Arthur Court and Bruce Beasley made these floating mineral cylinders back in the early 1970's. It is most likely that Arthur hand signed this piece. No more than 30 various pieces were made. They were sold at his design shop at 10 Hoteling Place and then at 888 North Point in San Francisco to top designers of the time. One was given to then Governor Ronald Reagan as an award. We have two floating mineral cylinders in our private collection. Pyrite must be beautiful. Truly, Elena Court." 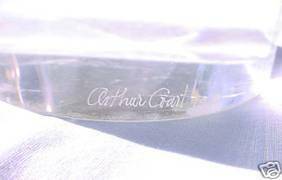 Arthur Court is probably best known for his dinnerware and house wares made of aluminum. They are very detailed, very intricate and very artistic. His works are sold through his company, Arthur Court Designs.